I've been deliberately not writing Brexit posts for a while. Largely because the choices that have been made sound so counterintuitive and illogical that reading about them didn't feel like it was adding to my understanding, which means that following them wasn't leading to any conclusion. There's no point watching a randomly wandering child if what you care about is where they're going. But at this point the choices are narrowing. And although we still don't know which one we're going to end up with, I figured it would be useful to me to write them down, along with how we got here, and others might find them likewise useful. Theresa May has failed to pass her deal twice, and been told that she can't bring it forward again. She can, of course, bring it forward again. By passing a motion to bring it forward. But that requires a majority to debate it. Which it's not clear she has. Apparently some Conservatives who voted against it are upset that they now can't vote for it. Which is the kind of performative idiocy which got us into this disastrous mess in the first place. She's now gone to the EU to ask for a short extension. They've said "You can't have an extension without a reason for it." Which is a surprise to nobody, because they've been saying that for a long time. The UK needs to put forward either a referendum or an election or some other thing which might actually lead to an actual decision. They have no interest whatsoever in just letting this drag on pointlessly. Frankly, they have better things to do with their time. So the options remaining are to tell the EU we need an extension for something meaningful (basically, either a general election or a referendum), to vote for May's Deal, or to crash out with No Deal. All of these are plausible results of the next week. None of them seem any more likely than any of the others. There are a few things I don't understand. I don't understand what the No Deal people are thinking long term. Are they planning to _never_ have a deal with the huge trading bloc next door? Because I would assume that when the UK decides that it does want a deal that really high up the list of EU demands will be open borders with Ireland, with everything that entails. I don't understand what most MPs are thinking. I don't know if they don't understand the EU, are avoiding thinking about the EU, or just don't want to step out of line with whichever party bloc they're following. Rees Mogg I understand - he's got a huge amount of money and Brexit could make him even more. Boris wants to be PM, and will say anything to get there (and the truthfulness of his words is irrelevant to him). Theresa May has decided that she must deliver Brexit no matter what. But most MPs seem to be wilfully ignoring how the world works, vaguely hoping that someone else will be the adult in the room and save them, and I can't tell if this is an intellectual inability to understand, or a wilful refusal to look at the facts. To be honest, at this point I don't think May's deal is _that_ bad. It hilariously traps us in the EU until magic sparkle technology fixes the Irish Border Problem. And it leaves things open for frankly any kind of actual relationship. No Deal is catastrophic, obviously. Food Riots are not something we should be seriously considering. My preferred solution would be to revoke the whole thing, but as there's absolutely nowhere near the numbers for that in parliament, I strongly suspect that should it come down to the wire that MPs will be left with a choice between "Run another referendum", "Vote for May's Deal", and "No Deal". I'd like to hope they'd go for the referendum. But as Jeremy Corbyn is so childish that he'll stomp out of a meeting if someone he doesn't like is invited to it, the chances of actual compromise are incredibly low. So doom for all it is! Things I wish my brain didn't do. I really wish my brain didn't hold a list of "Things Andy doesn't want to think about", which it then connects to random other things that I didn't want my brain to be doing. Jane just messaged me with something that made her happy. So I sent her a message back, and included an animated GIF based on the search "Happy Dance". Which brought up Baloo dancing to "I Wanna Be Like You" from Disney's "The Jungle Book" (specifically the bit where he says "And I'm loaded with both"). Which instantly earwormed me with the song, because it's one of Sophia's favourites. And realising I was earwormed made my brain go "Oh yes, this is a brain thing we don't like. So now you've lost The Game too." And then, about a second later, added "And also The Human Centipede Game." And then I felt a compulsion to tell all of you about it, in the hope that this would in some way pass it on. Which makes me feel like I'm in The Ring. Which terrified me. 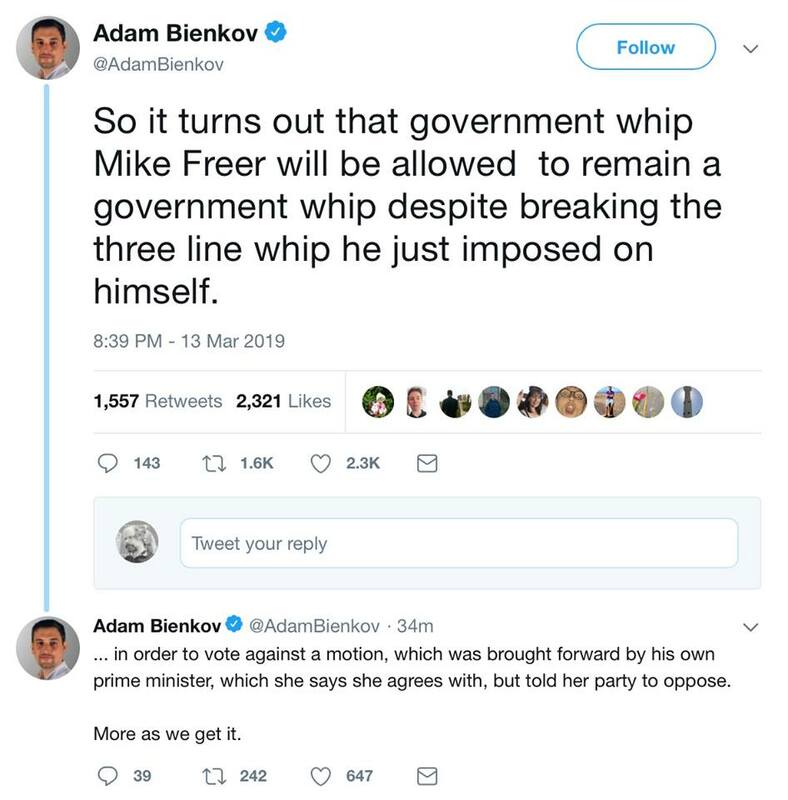 (For those not au-fait with British politics, a three-line whip means "You have to vote for this, or you are in massive trouble with the Prime Minister, and you may be thrown out of the party". And the government whip is a person who makes sure that members of the party do what they're told. Theresa May has lost _all_ control of her party.